After years of war, peace and tranquility have come to Laos and this small landlocked nation is slowly opening its doors and offering the intrepid traveller a warm welcome. With 5 days in Laos, this interesting tour enables you to discover the mysterious Plain of Jars, as well as taking in the fascinating cities of Luang Prabang and Vientiane. Welcome to Vientiane, the capital city of Laos. Vientiane is a fascinating capital, with a fusion of Lao, Thai, Chinese, Vietnamese, French and American influences. 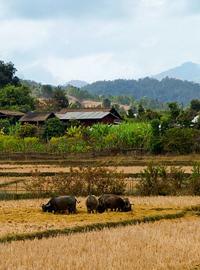 This charming and easy-going city will provide a smooth introduction to Laos. On arrival at Vientiane airport, you will be met and transferred to your hotel.In the afternoon, proceed to the city to visit Lao’s national precious heritage, the famous and sacred That Luang Stupa. You will have the opportunity to take some pictures of the imposing Patuxay Monument, also known as Vientiane’s own Arc de Triumph. After breakfast, check-out of hotel and transfer to the airport for the flight to Xieng Khouang. Xieng Khouang is best known for the enigmatic Plain of Jars comprising of thousands of stone jars varying in height from 1m to over 3m, in clusters of up to 300 jars. This is an archaeological landscape that combines ancient and contemporary history with authentic insights into Phuan, Hmong, Khmu and Tai Dam cultures. Your tour will cover Site 1 of the Plain of Jars followed by the MAG Exhibition. Though best known for the mysterious stone jars scattered throughout the province, Xieng Khouang has a number of other attractions. Old Xieng Khouang Town, now known asMuong Khoun was the centre of a former Tai Phuan Kingdom and boasts many centuries old pagodas and Buddhist temples. Unfortunately, many were either destroyed or severely damaged from heavy bombing during the war. Stop by the nearby villages, home to the Hmong hill tribe and Tai Dam people before returning to your hotel. It’s time to bid farewell to Luang Prabang. Transfer to the airport for flight out of Laos. End of services by Indochina Travel Service.